12/8/1941 Enlisted one day after the attack on Pearl Harbor at Fort Hays. Marion had studied pharmacy and pre-med at the Ohio State University. 1942 Went Camp Roberts, California for Combat Intelligence. Later transferred into the Medical Corps. 1943 Went with the 29th division 116th regiment to train for over a year for the invasion of France. 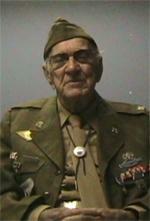 7/18/1944 Marion and his regiment liberated Saint Lo, France. From there he went through Cherbourg, France. From there they went north through Paris, then Belgium then into Germany. 5/1945 Pushed to the Elbe River and held defensive positions until the war was over in Europe. 6/1945 Transferred to the 69th Division as a combat medic.